Neoprene Rubber Sheet Description:Neoprene rubber rolls are available for a range of applications in the industrial and residential markets. This type of neoprene rubber has excellent stretching capabilities while remaining strong enough to be elastic. Neoprene rubber rolls are available in 50 to 60 durometer and can be ordered in other durometers by special request. With an average elongation of 250% and an average of 900 PSI tensile strength, Neoprene rubber rolls will handle most tough industrial environments and moderate to heavy alkaline and chemical resistive situations. Neoprene Rubber Rolls are in accordance with ASTM D 2000 and SAE 3200. Applications: Neoprene is resistant to many chemicals and oil, making it particularly useful for flooring, table tops, machine shops and auto repair shops. Neoprene is used where abrasion can be prominent and the neoprene has to hold up under repeated uses of abuse… like those in a sandblasting or shot blasting room, industrial plant as a shock absorbing pad. Neoprene in Roll form is a very durable material for long time use and applications… being as the material is in a roll, it is an excellent purchase for volume runs on production parts. Email us your drawings if you need rubber gaskets or rubber parts made. Description: Neoprene Fabric reinforced sheets are fiberglass fabric coated with neoprene rubber on both sides. Reinforced Neoprene is designed for use in applications where stresses are typically static and pressures are usually low. Cloth inserted Neoprene rubber has a glass fabric featuring flame & heat resistance, excellent dimensional stability, inert to most common chemicals, high strength to weight ratios, fungus and mildew resistant. Reinforced Neoprene rubber can be used as a flange gasket where a bolt or compression loads are so high that non reinforced rubber would squeeze or extrude out between the flanges. Applications include meters, control devices, welding curtains, regulators, pumps, and diaphragms. Fiberglass reinforced neoprene diaphragms usually contain one or more plies of reinforcing fabric for added strength and this neoprene material would be well structured for a re-enforced rubber application. 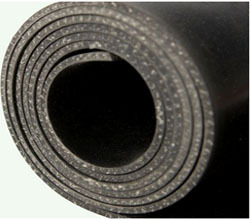 Description: EPDM rubber rolls are available for a range of applications in the industrial and residential markets. This type of EPDM rubber has excellent stretching capabilities while remaining strong enough to be elastic. With an average elongation of 300% and an average of 1,000 PSI tensile strength, EPDM rubber rolls will handle most tough industrial environments and moderate to heavy alkaline and chemical resistive situations. EPDM rubber rolls are available in 50 to 60 durometer and can be ordered in other durometers by special request.